Game four ended quickly in a draw. A not-so exciting game by the top players. The game ended after only 29 moves when many of the major and minor pieces were exchanged. Here is the game. 1.d4 Nf6 2.c4 e6 3.Nf3 d5 4.Nc3 Be7 5.Bf4 0-0 6.e3 Nbd7 7.a3 c5 8.cxd5 Nxd5 9.Nxd5 exd5 10.dxc5 Nxc5 11.Be5 Bf5 12.Be2 Bf6 13.Bxf6 Qxf6 14.Nd4 Ne6 15.Nxf5 Qxf5 16.0-0 Rfd8 17.Bg4 Qe5 18.Qb3 Nc5 19.Qb5 b6 20.Rfd1 Rd6 21.Rd4 a6 22.Qb4 h5 23.Bh3 Rad8 24.g3 g5 25.Rad1 g4 26.Bg2 Ne6 27.R4d3 d4 28.exd4 Rxd4 29.Rxd4 Rxd4 ½-½. The 5th round will be 2 days from today. Tomorrow is rest day for the players. 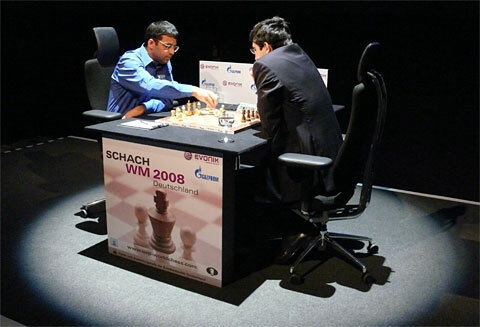 Can Kramnik catch up or will Anand defend his crown? Apparenly most people think Anand will win. Vote now for your favorite! Be part of something historic by voiceing your opinion today!